IPS Correspondent Nalisha Adams interviews DR. CYRUS RUSTOMJEE, a former director of economic affairs at the Commonwealth Secretariat, and a senior fellow with Global Economy Programme, Centre for International Governance Innovation. 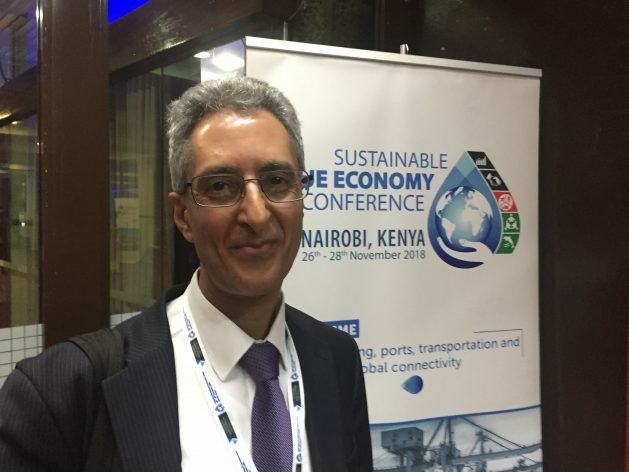 NAIROBI, Nov 26 2018 (IPS) - The first every global conference to address the twin focuses on both conservation and economic growth of the oceans has fulfilled the broad range of expectations it set out to define. It could also be starting point for spurring on a whole new range of global development co-ordination challenges harmonising terrestrial and ocean-related laws and treaties. This is according to Dr. Cyrus Rustomjee, a former director of economic affairs at the Commonwealth Secretariat, and a senior fellow with Global Economy Programme, Centre for International Governance Innovation. Rustomjee was at the Sustainable Blue Economy Conference in Nairobi, Kenya as some 18,000 participants gathered in the East African nation. The conference hosted by the Kenyan government and co-hosted by Canada and Japan, set out to discuss how to create economic growth that is inclusive and sustainable, how to ensure healthy and productive waters, and how to build safe and resilient communities. Rustomjee has held various positions for his native South Africa with the International Monetary Fund and the World Bank. IPS was able to speak to the South African who holds a Ph.D. in Economics and a Masters in Development Economics. Inter Press Service (IPS): Can you tell us in terms of this conference what were the expectations that you had coming here. Cyrus Rustomjee (CR): I think I didn’t want to create expectations for myself about this because it is the inaugural Sustainable Blue Economy Conference. It hasn’t happened before in this way. We have had conferences on the Blue Economy in various parts of the world, we have had global United Nations-driven conferences. We haven’t had one which tries to bring together the conservation and the growth dimensions of the Blue Economy. In the past they have really been seen as two contending perspectives of the Blue Economy, where as in fact what this conference is saying is that they are part and parcel of a sustainable blue economy. You have to have sustainability of the oceans if you want to harness the wealth or other opportunities from it. But at the same time you can’t continuously focus on conservation because there will be some who will exploit the ocean while others persist simply with conservation. So the benefits that the ocean offers will be then inequitably shared. No one wanted to confront this issue at a global level. And to try to discern practical ways to harmonise this and to bring these two strands, which is a common concept together. So I didn’t have any particular expectations. I had a whole lot of questions about the scope and the ambition of the conference. And that has been fully fulfilled. Because I think the scope is enormous, it’s covered a very very wide range of policy issues, a wide range of conceptual issues, it’s brought it science, it’s brought in legal frameworks and transboundary challenges which are part of the unique characteristics of this sustainable blue economy concept. It really has brought many many countries to the table to discuss, in some sense without preconceived positions, which is very valuable. Which is really saying let us kind of take a step back and then take a collective step forward. And I think that is what is happening at this conference. IPS: In light of what you have heard, what are your first impressions? CR: It is only day one. First impressions are that I wasn’t sure to what extent an African voice would come forward. Because it is in this space that the fullest potential of the Blue Economy will reveal itself or not in the years ahead. So Africa has watched the oceans being utilised and has hesitated to utilise the resources of the oceans for a whole host of reasons, including insufficient technology, skills, human resources, legislative frameworks, co-ordination at an inter-continental level and many many other factors. Whereas I would say many advanced economies particularly have gone surging ahead with the blue economy, whether sustainable or not, I don’t know. Now Africa has an opportunity to take advantage of all of that. And build on continental momentum to do so in many other areas. For example, we just recently secured a continental free trade arrangement and there are already ingrained in African continent-wide policies and strategies the concept of the Blue Economy. It is the 2063 Agenda [of the African Union]. It is in the 2050 Africa Integrated Maritime Strategy (AIMS) framework. Not it is time to operationalise it in practical ways. So a big take-away from me is there is clearly the will, the determination, the excitement, the collective endeavour at an African level to take this forward. I think if there is anything we look back on in, say five years from now, we will look back at two things. One is, this is where the world got together to recognise this concept as a practical mechanism in some sense for operationalising sustainable development fully. Not only in terrestrial activity but across the whole spectrum of what the earth’s surface is. The second big thing from today is the arrival of the African Blue Economy as a real prospect. IPS: Kenya says it wants to lead the way in building a sustainable blue economy. With your background in finance and development, can you give us some key take-aways they need to look at? CR: It’s a difficult one because we are very much in a pioneering state for a continent that has 38 coastal states, and has 31,000 km of coastline, and which also has 13 million square kilometres of exclusive economic zone. It’s a huge, huge environment. [The number of people living along the coast] is high and it’s rising. For a whole host of reasons. We are at the dawn of the journey. We are at the dawn but in the context where there are many components that is encouraging many african countries have started developing their blue economy strategies and laws and concepts. And they have started to tackle some of the co-ordination issues that come with that, simply-explained ones, co-ordination between the coastal tourism and fisheries sectors, for example, jurisdictional issues between different portfolios, they’ve developed integrated coastal zone management strategies and many have developed marine protected areas and have started working on the challenges in sustaining those. Many have been in the forefront, globally now, of innovative blue finance [for example the Seychelles issued a Blue Bond last month]. We are seeing a lot more activity at a regional level. We are starting actively to see discussion about how to integrate regional and continental initiatives. In a certain sense the Blue Economy in an African context is an African Blue Economy, not an African-specific national series of Blue Economies. That is where the full potential of the Blue Economy will arise, rather than at a national level. We are starting to see this is part of the longer-term vision which we will end up realising as a continent. So there are lots of promises, lots of opportunity and lots of action. But a lot of action is happening at a national level and some critical steps for the future now, in an African context is to build the institutional capacity to share knowledge, experience within the continent and to build the institutions what will quickly bring the inter-continental collaboration needed to realise the Blue Economy.